If you lead an active and healthy lifestyle, you probably make a priority of going to the gym or fitness center 3 or more times a week. Now what if you have tennis elbow, how does that change what you can and can’t do at the gym, in terms of your exercise routine? As a certified personal fitness trainer, I am well educated on what exercises work for specific body parts. Today’s fitness centers are equipped with the latest technology with a variety of machines, cables, dumbbells, barbells and cardio equipment. With so many pieces of equipment to choose from, the skies the limit with regards to the number of exercises you can do to stay in shape. So what exercises should you totally avoid when you have tennis elbow? Any exercise that involves dumbbells! The reason to avoid dumbbell exercises is that you could cause further damage to your already injured elbow tendons. When you use dumbbells you have a greater range of motion, which basically means that your arm is free to move any which way without limitation. The last thing you want to do if you are to ever recover from tennis elbow is to cause further damage. So what are your best options for getting in a workout without using dumbbells? You can still get a great workout without using dumbbells. Stick with barbells and machines. In doing so, you decrease your range of motion which decreases your tennis elbow recovery time. Using dumbbells puts you at risk of tearing your already damaged tendon away from the bone which will require surgery to fix. 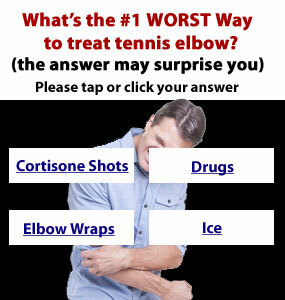 As part of the Tennis Elbow Secrets Revealed System, you will get a complete list of tennis elbow safe exercises that you can perform and implement as part of your exercise routine so you don’t have to give up going to the gym or fitness center. 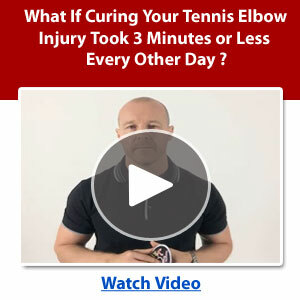 These exercises will not cause any further damage, make your tennis elbow worse or interfere with your progress through the Tennis Elbow Secrets Revealed System. Unfortunately we do not accept debit card as payment. But you can pay with your paypal account or with a Visa or Mastercard. Tennis elbow and golfers elbow are treated the exact same. The only difference is the location of your injury. Tennis elbow on the outside of your elbow and golfers elbow affects the inside. The program is effective in eliminating golfers elbow as well as tennis elbow. Will these techniques work the same as holders elbow ? You don’t have to wait for the pain to subside altogether. As you get started with the program, you may experience a little muscle soreness and inflammation but this is absolutely normal, so don’t be alarmed. It is no different than if you worked out at a gym for the first time, you would expect muscles soreness the next day. The techniques that I teach in the tennis elbow system WILL NOT make your injury worse. They are specific to a tennis elbow injury and focus on strengthening your torn extensor tendon. Keep me up to date on how things are going. Thanks a lot for this useful tips and to your e-mail i m regulerly doing a workout in gym. but becaus of tennis elbow its peinful for me.. i m interested to buy a cd of your tennis elbow secret but i m leaving in india ..can i aveleble cd in india. Thanks a lot for this useful tips and to your e-mail. I’m working as an Executive Secretary, so my fingers all the time on the keyboard. I’m not practicing any exercies, except at home with routine work. It still giving me pain, especially when lifting this, even a bottle of water or my small hand-bag. I did your exercise which helped me a lot. I’m sufferling also from Carpal tunnel syndrome in my left hand. The tennis one is in my right hand. Thanks again for your help. Thanks for the post. If your pain is mostly located on the outside of your elbow and you notice that your grip has been getting weaker, your elbow hurts when you grasp objects, such as a golf club, or your elbow hurts when you extend or flex your wrist – then Yes, you most likely have tennis elbow. GEOFF—MY DOC @ KAISER THINKS MY INJURY (CANNOT STRAIGHTEN LEFT ARM COMPLETELY WHILE EXTENDING AND I CAN’T BEND IT WHEREAS TO TOUCH MY FINGERS TO THE TOP OF MY SHOULDER) IS CONSIDERED TENNIS ELBOW ..I DO PLAY A GREAT DEAL OF GOLF AND BELEVE THIS IS CAUSED BY POUNDING GOLF BALL @ IMPACT ON GROUND–WHAT DO YOU THINK????? THANKS— RICH H.
Hi I’d like to say how often should I be doing the hammer exercises when I unload truck all day at work? I put ice on it for 20 mins, then heat for 20 mins. I’m currently doing your stretches you sent me to do, I’m doing very good with them and it’s helping. I like to play darts but since having this I’m not able to throw without pain, I played badminton left handed hard but It takes time being right hand dominant. I love playing badminton and darts but how soon can I go back to these things, so I don’t overdue it and stress it again? Any Comment’s Appreciated Thx GEoff!! I was going to the gym at least 3 times a week and swimming a 1/2 mile (free style, backstroke, and kickboard) but had not been swimming as much since I got tennis elbow as I noticed that it makes my arm ache a lot afterword. Am not getting sharp pains at least not yet. I have tried the bike but I it is not my favorite. I like to use the sensor areas on the bike to monitor my heart rate so I can make sure that I am getting the kind of exercise I need but keeping my arm straight hurts or makes my arm ache. This morning I had a foot of snow to shovel off my driveway and that caused pain despite trying to be careful. I am hoping the hammer exercises, and the warm up with the towel exercise will help. I am at least not getting excruciating pain anymore when i try to squeeze or grip with my hand. So have some improvement. Glad to hear you’re elbow pain is subsiding! As for working out and playing tennis, yes you can go back to those activities as long as you are continuing to implement the techniques from the Tennis Elbow Secrets Revealed system. When you’re at the gym, simply avoid doing exercises with dumbbells. This is where you’re chance of re-injury can occur. Using dumbbells increase your range of motion which can cause strain and pressure of your elbow tendons and muscles, best bet is to avoid them. As for playing tennis, don’t go out and play 3 sets right out of the gate. Work your way back into it and remember to ice your elbow after the game. Don’t perform the tennis elbow techniques on the day you play tennis. Other than that, stick with the tennis elbow system – it’s gold! hey Geoff…feeling better. still have issues with forearm and elbow being sore. I’m 45 very good shape. like to play tennis and work out. i have only had ur program for 5 days. what can u advise me on n regards to playing tennis and or working out. I’m afraid if i do either i will set my injury back. thankyou Geoff, your advices and treatment tips all are very nice. esp.. video for exercise how to do with hammer , nice explanation. thanks, all your tips are really handy, i workout at a very qualified gym everyday and when i encountered the problem with tennis elbow the gym fitness councellor advised me to stop dumbell exercise like you did and he recommended other pulley machines whereby i could continue without damaging my ligaments and also do not develop atropy by stopping completely. Thanx a lot Geoff,now how do I order and how much will it be in Rands as i am in RSA. No problem. If you don’t have a credit card, we also accept Paypal as payment. I want to start as soon as possible with exercises but dont have credit card, how can I get the DVD? How do I purchase the exercise DVD if I dont have a credit card? How do i get it. Thanks for your concern. I shall follow your advice. but i m fill very bad without gym i have do exercise at home can i do ? pls give me advice. Hi, i tried to download yr instruction but it halted at 2:22 , i will try agin later. (the place where we once described as the “funny bone”). I found sleeping on my right side with my arm under the pillow causes the most discomfort. Sleeping on my left side with my right arm over another pillow has provided some relief. I am also trying Tai chi to get some extension in my joints. Thanks for your concern. i do not go to gym but do exercise at home. I used dumbel aggravating my problem. I have stopped doing exercise that has decreasd my pain. I shall follow your advice. I accordance with my physio, I put elbow joint in warm water and and suination and pronation for about 15 minutes. In addition, i apply ice to elbow before going to bed. Any comment ?? I don’t do any exercise that involves dumbbells or weights, however, I am engaged in work where I lift 20kg cement bags. At the moment, I am doing this 2 days of the week at about 10 bags per day. Part of my work also involves holding on to an object for a long time to keep it steady so this places a lot of stress on my elbows. Will the treatment work under these conditions ?